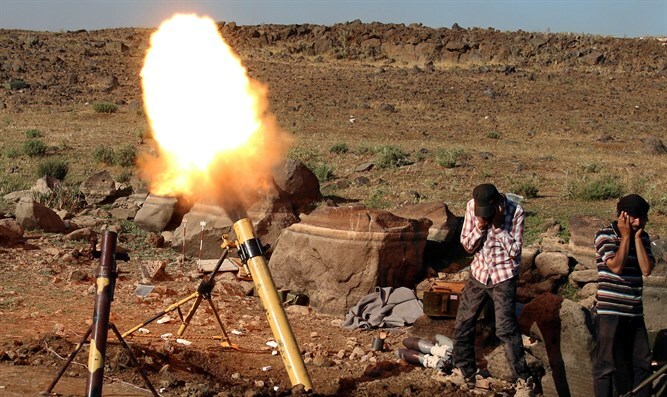 Senior jihadist commends Israel for striking Syria during Saturday flare-up. A former leader of Syria's Al Qaeda branch commended Israel for striking Syria on Saturday, after the Assad regime shot down an Israeli F-16I fighter jet. On Saturday, the IAF identified an unmanned Iranian aircraft entering Israeli airspace. The aircraft remained in Israeli airspace for a minute and a half before being shot down. In response, four IAF F-16I attacked the drone's control center deep in Syria. While they were operating, Syria fired dozens of surface-to-air missiles, hitting one of the F-16I fighters, forcing the pilot and navigator to eject once they reached Israeli territory. Meanwhile, the IAF responded to the attack on the F-16 by beginning a large-scale operation against Iranian targets in Syria, destroying at least four sites and additional facilities as Syria fired surface-to-air missiles towards the planes, activating Israel's air raid sirens on the northern border. The strikes were praised by Saleh Al-Hamwi, a founder of Syria's Jabhat Al Nusra. Jabhat Al Nusra, or Nusra Front, is an Al-Qaeda offshoot in Syria and are one of the Assad regime's opponents in the bloody civil war. Al-Hamwi tweeted that "we welcome any Israeli aerial or naval bombardment against the regime and Iran in Syria. We urge them to do more. And we say to Israel: Your silence over Iran’s intervention in Syria will turn against you. It’s inevitable. Act with haste to uproot them". According to Al-Hamwi, Iran had laid a trap for Israel by readying its anti-aircraft surface to air missiles around the area from where the UAV was launched. "Iran sent a drone and penetrated Israeli airspace with the prior knowledge that Israel would respond and bomb the launch site of the UAV. The decision was made in advance to bring down any Israeli fighter plane that would bomb the airport," wrote the jihadist. IAF Chief of Staff Tomer Bar had said on Saturday afternoon said, "The Iranian drone was a very advanced model. It remained in Israeli airspace for a minute and a half." The incident was the most serious since the civil war in Syria began in 2011, and the largest IAF operation against Syria since 1982.